Adding a new option in the book information "Configuration" section (Ultimate BB > Book Information > "Configuration" at the bottom). This allows you to enable or disable the field and place it where you want. Creating a new box on the Add/Edit Post page where you can enter the value. Registering our placeholder shortcode with UBB. Displaying the value on the front-end with your review. Create a new folder for your plugin on your computer. I'll be calling mine ubb-book-setting (don't use any spaces!). Then, inside that folder, create a new PHP file with the same name. Mine is called ubb-book-setting.php. Inside this file, create your plugin header. This gives WordPress information about your plugin. * Description: Adds a new field for the book setting. Add a new option to the book info configuration. 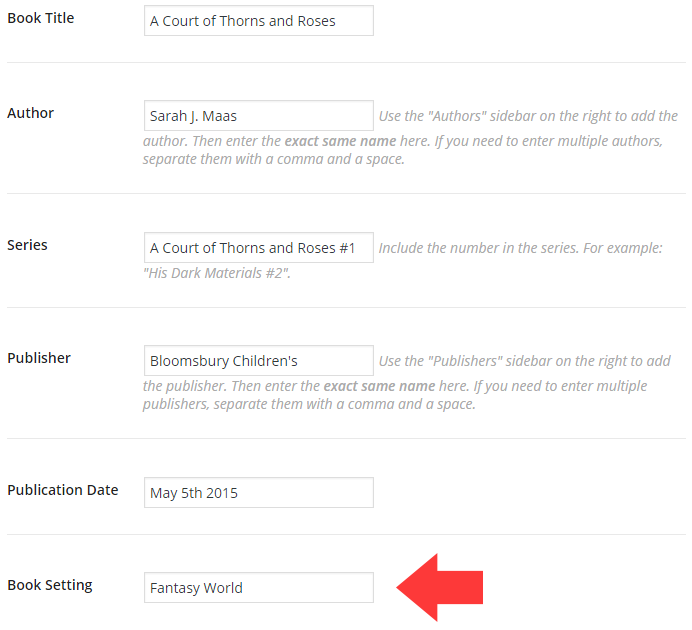 Our first real coding step is to add a new option to the book info configuration (pictured below). 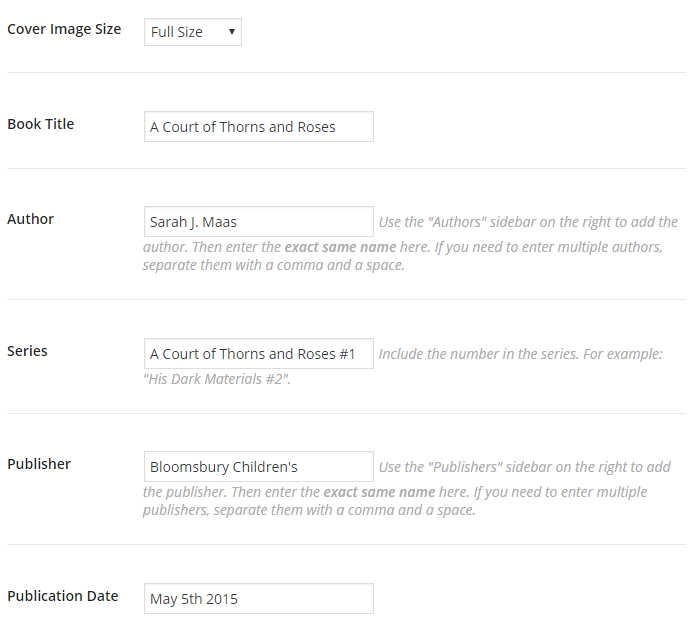 This will allow you to actually insert the new option into your book info and customize the template for it. Place this next code after the PHP header (still in the ubb-book-setting.php file). * Adds a new entry to the book info configuration for book setting. // Change 'book_setting' to whatever you want. No spaces! You'll want to replace that with a key that represents your custom field. We'll be using this again later. Your key should be all lowercase and use underscores instead of spaces. This line contains the title that will appear in the admin area configuration columns. Change this to be the name of your custom field. Here we have the description. This is what gets displayed under the title when you click "Edit Text" on the field. The description also references the placeholder shortcode [setting]. This is something you can make up. We'll be making it work later. But you should use all lowercase and hyphens instead of spaces (so [book-setting] is good but [book setting] is not!). This is the default label that will appear in "Edit Text" when the plugin is first installed. But this can always be changed later inside the settings panel. Notice how the placeholder is used in here. Adding a new field to the Edit Post page. We need to add a new text box field to the Edit Post page along with the other book information. Here's the code to make that happen. Paste this directly below our previous code. And once again, let's dissect this a little and figure out what you can edit to make your own. Just like before, you can change the function name to match your custom field, but once again, you need to make sure it's the same in both places. Edit that to match your own key. This is the title that's displayed on the Edit Post page to let you know what field you're editing. Each field needs a unique ID. 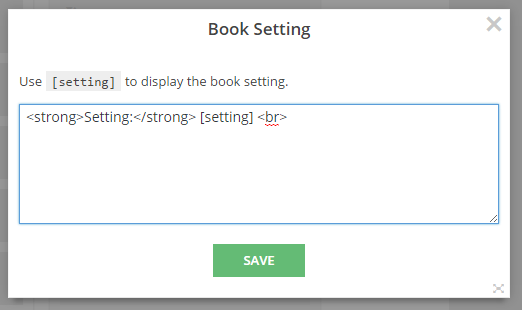 You should swap out 'book_setting' with your own. Make sure it's the same one we've been using all along. This is where you specify what type of field should show up. In our example, we're using 'text_medium' for a "medium text box". Remember that [setting] placeholder we used inside the field template? We need to register that shortcode with UBB so it knows what to look for. * Register the [setting] shortcode with UBB and map it to our book_setting key. As before, you're welcome to change the function name in both places. Highlighted above is the custom field key that we've used several times already. Swap that out for your own. Highlighted above is the placeholder shortcode. This is what you set in the first step when adding the field to the configuration. Add the same shortcode here. Retrieving the saved value to display on the front-end. This last step brings everything together and will allow your custom field to show up on the front-end of your site with the other book info. * Gets the value of our custom field. Again, you can change the function names. First, we perform a check for our custom field key. This ensures we're only getting the value for our custom field, and not messing with other fields in UBB. Be sure to change that to your key. Then, we use a really simple UBB method to easily get the value from the database. Once again, that should be your custom field key. Zip up your folder to create a zip file. Go to Plugins > Add New > Upload in your admin area and upload the zip file. Go to Ultimate BB > Book Information and scroll down to the "Configuration" section. Drag your field into the "Enabled" column where you want it. Add/Edit a post and fill out your custom field (and other UBB book info). It should now show up on the front-end!